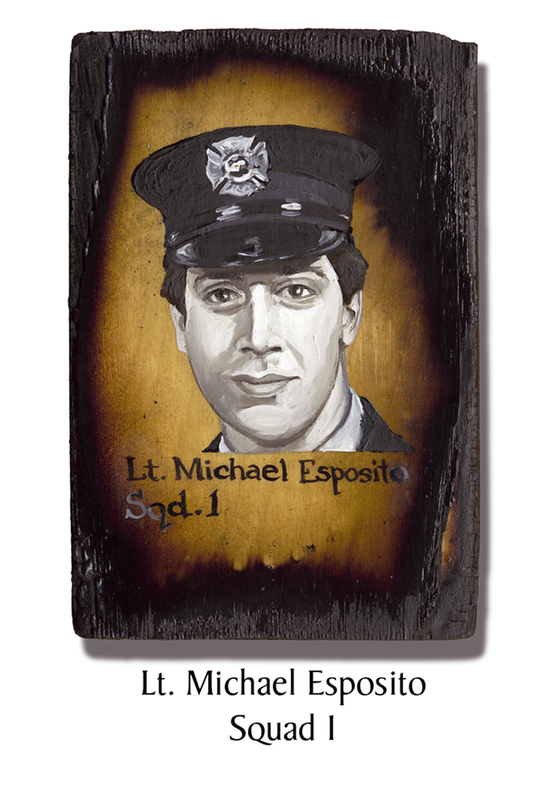 Lt. Michael Esposito, 41, was posthumously promoted to Captain after 9/11. Nicknamed “Mel” after an “average guy” character in a Rodney Dangerfield movie, Esposito was on a 24 hour shift. Esposito had responded with the NYC Search & Rescue team to the Oklahoma City bombing and spent five days in the rubble searching for victims. Again he went upstate NY with FEMA in 1998 in response to a deadly ice storm that left half a million people without power in crippling cold. He was a certified EMT with training in scuba and haz-mat who competed in triathlons and a former member of the FDNY boxing team. His cousin Frank Esposito of Engine Company 235 was also lost at the WTC. His son Michael, graduated from the FDNY Academy in December 2013. This entry was posted in Better Angels Stories and tagged 343, 9/11, better angels, Dawn Siebel, FDNY, firefighter, firefighters, firefighters of 9/11, LODD, Manhattan, memorial, Michael Esposito, NFFF, paintings, portraits, Squad One, World Trade Center, WTC. Bookmark the permalink.